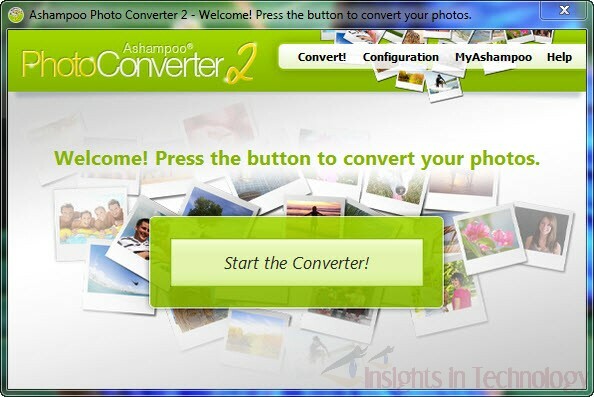 Whether your pictures are blurry, grainy or overexposed – with just one click Ashampoo Photo Converter 2 optimizes and organizes your images and simplifies your workflow. You can individualize your photos with a variety of effects, color adjustments or image frames and create memorable pieces. Despite its great range of features the software only requires very few system resources and won’t stump your computer – whether it’s a new or older model. 2BP, APCDOC, BMP, CAM, CLP, CUR, CUT, DCX, DDS, DWG, EMF, EPS, EXR, FLT, GEM, GIF, HDR, HRZ, ICO, IFF, JNG, JPG, JP2, JPP, JXR, LVP, MAC, MNG, MSP, PCD, PCT, PCX, PFM, PIC, PIX, PNG, PNM (PBM, PGM, PPM, PNM), PPP, PSD, PSP, RAS, RAW, RLA, SGI, TGA, TIF, WBMP, WEBP, XBM, ZBR. 2. Correct image misalignment by rotating (90° left/right & 180°), mirroring or flipping images. 3. Resize images by specifying image widths and heights in the following dimensions: Percent, Pixels, Centimeters, Inches, with or without locked aspect ratio. Supports size filters in batch processing: Apply to all images, Only if image is smaller and Only if image is larger (than the value defined). Gamma, Brightness, Contrast, Temperature, Hue, Saturation, Change color depth (2, 16, 256, 65k or 24.7M colors + alpha), Change RGB order (color channel swapping). 5. Add watermarks in images in desired transparency and position (TopLeft, TopCenter, TopRight, LeftCenter, Center, RightCenter, BottomLeft, BottomCenter, BottomRight). 7. Organize image files better by inserting EXIF Date, deleting source files after conversion, keeping original file date/time. Software installation is smooth and creates desktop & quick launch icons by default. Software installation is multilingual: 15 languages are supported. Like always you need to choose custom setup and use the recommended setup options to avoid installation of useless MyAshampoo Toolbar. Min. 37 MB free Hard disk space. Active Internet Connection for license activation & update check. Administrative rights for software installation & uninstallation. System Resource usage is minimal at idle time and moderately low during processing. By default the software trial period is of 10 days. You can extend the trial period to 30 more days after registration. At installation end, the software automatically opens the registration page for trial extension. A dialogue is also opened at installation finish where you are enter your paid/trial license or continue without that. The software GUI is multilingual: supports 29 languages. To translate the software in your own language, use the language editor. The first look of the GUI is pretty charming. After starting the converter, you will be prompted to follow an wizard to accomplish your goal. Step 1: You will be needed to import images by browsing. 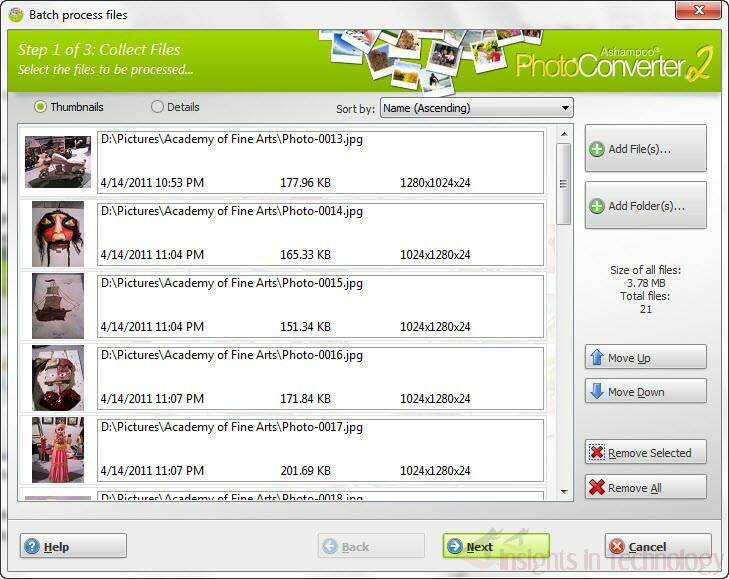 Step 2: In this step, you will have to set all the options for batch processing of the images. 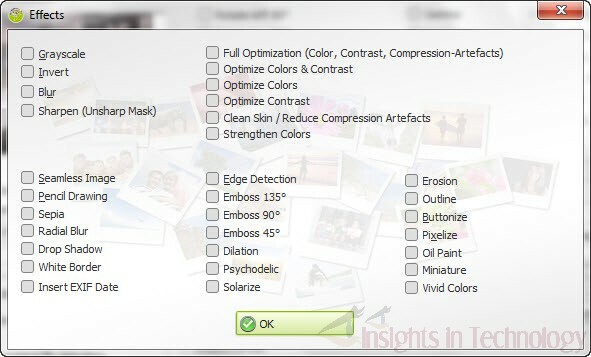 A number of image effects are supported as already mentioned. Step 3: This is the processing step. Clicking on Start in Step 2 starts the processing. At processing end a successful message will be showed. Clicking on Finish will bring you back to first screen. The software is also set to update automatically. It also offers news, recommendations, premium version notification via service channel but you may choose your appropriate settings. Detailed offline help file is instrumental to the understanding of each settings. Like every Ashampoo software, this one is also excellently designed for easy navigation with faster workout. Drag & Drop is yet again missing. The software is highly recommended. The software is priced $14.99. Angela Woisch from Ashampoo has arranged 10 licenses of the software for our blog readers. 1. Like Our Facebook Fan Page. 2. Share this post in Facebook. 3. Comment below with the link of your share. Giveaway will run until 9th September, 2012, 23:59 Hrs GMT. Winners will be chosen randomly.Good Luck !! Thank you for this giveaway and please count me in. Thanks Sujay for another great giveaway from ashampoo.